Ok, the movie is pretty similar to 2002’s “Phone Booth”, in which Colin Farell was trapped in a booth by a sniper. 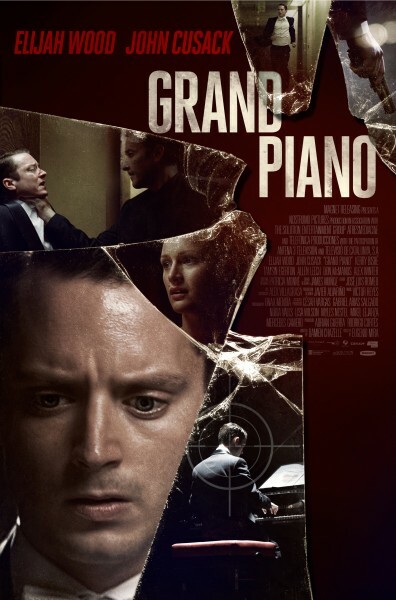 In “Grand Piano”, we’re in a concert hall and Elijah Wood plays a world class pianist who finds himself forced to play flawlessly or have his wife gunned down by a madman. What’s next? Says director Eugenio Mira (who’s a composer himself): you bring an accomplice to the scene, have a couple of murders, and add some colorful music. The trick comes in pinning us to our seat for almost an hour before the whole thing becomes so damn predictable. But until then, Mira, with the help of his gifted cinematographer makes a tense job of it. Casting Wood in the lead role was a good choice. And John Cusack, whose sniper role is essentially a voice on the phone is chillingly good as well. “Grand Piano”, a Spanish thriller shot in Barcelona isn’t entirely satisfying, but no way will it fail to entertain you.